﻿ Countryside Capers at Kielder - National Countryside Week - so much countryfund to be enjoyed at home! Home > News > Countryside Capers at Kielder - National Countryside Week - so much countryfund to be enjoyed at home! Countryside Capers at Kielder - National Countryside Week - so much countryfund to be enjoyed at home! National Countryside Week* takes place from Monday 30th July to Sunday 5th August 2018. Every year the campaign aims to raise awareness and celebrate the values of the British countryside. And we’re luckier than most in the North East as we literally have miles and miles of it! Countless famous writers have praised the beauty, calm and restorative effects of the countryside on the human spirit. And in this gloriously hot summer, even here in the cooler North East, where better to enjoy some peace than in our own idyllic surroundings? The Heritage Lottery-funded Living Wild project at Kielder aims to bring Kielder Water & Forest Park’s amazing wildlife and countryside to life for visitors and residents, helping them enjoy, learn, share and immerse themselves in nature whilst also contributing to the long-term protection of the area’s special animals and plants. So, take a little time way this summer, even for a day. Forget the household chores, the noise and stress of crowded shopping malls or theme parks and head to beautiful Kielder Water & Forest Park. There are some wonderful countryside activities here that you won’t be able to experience anywhere else (many are free or very low cost) and we guarantee you’ll return refreshed and relaxed. Here are 10 to try! 1. Osprey Watch operates at Kielder Waterside on Saturdays, Sundays and Bank Holiday Mondays, 10.30am -17.00pm and on Wednesdays too during July and August. 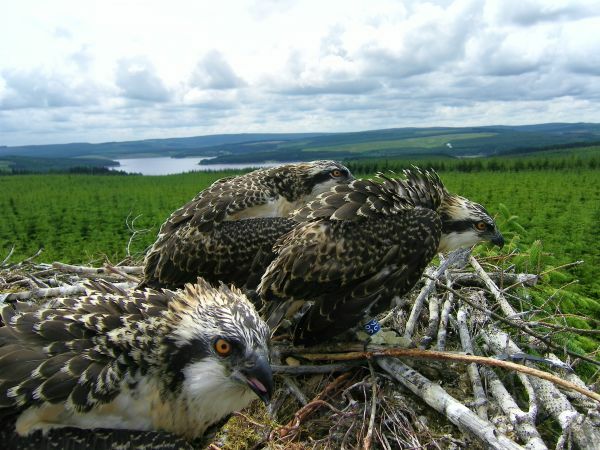 2018 is the 10th successive year of Ospreys breeding in Kielder Forest. During that time, the population has grown from one to four breeding pairs. 3. Red squirrels - Around 50% of England’s native red squirrel population live at Kielder, the largest remaining stronghold in the country. You can learn more about red squirrels in the exhibition at Kielder Castle, where there is also a squirrel hide overlooking native woodland. Another great place to catch a glimpse of one is at the red squirrel hide at Kielder Waterside. Find out more through the Red Squirrels Northern England project. 6. Bakethin Nature Reserve which includes car park, wildlife hide, lake and walks is open all day every day of the year and is free to visit. Here you can watch wildlife, birds and plants and enjoy beautiful nature walks through the trees. You can explore the mossy forest floor, spot water creatures from the pond platform, see strange, gnarled lichens clinging to the branches, and search for signs of squirrels amongst the pine trees. 8. The lovely Lakeside Way multi-user track encircles Kielder Water's 27 mile shoreline and is almost 26 miles in total. It is suitable for walkers, cyclists, horse riders, mobility scooters and wheelchair users. It gives access to the most scenic parts of the lake shore and offers visitors to Kielder Water & Forest Park a lovely, unique experience in all weathers. 9. Kielder Salmon Centre re-opens after a major refurbishment in mid-August. It’s close to Kielder Castle, is the largest conservation hatchery in England and Wales, and it’s where the Environment Agency grows fish to stock rivers and lakes in the north of England. Up to 900,000 salmon are successfully bred here each year.